There is something amazing about being able to walk along a beach, no matter what the weather. It can be relaxing just simply being there, watching those waves crash against the shore. One thing that can make the entire experience even better is sharing it with your dog. Watching them running around, splashing in the water and just generally having an amazing time is a memory that you are going to treasure forever. The only trouble with this, particularly in areas such as East Devon, is that it can be hard to find a decent dog friendly beach that you can take a walk along. This is especially true during the summer months when certain restrictions are put in place across many of the most popular beaches in the UK. If you are looking to spend some quality time with your dog on the beach it’s always important to do some proper research, which we all know can take hours. This is why I’ve put together this post, which goes through all the key information about walking your dog on Exmouth beach. 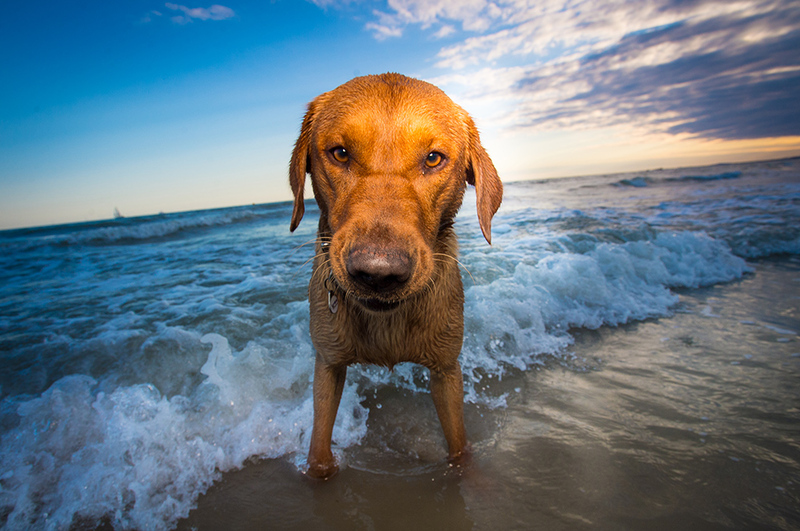 By doing the hard work for you, all you have left to do is sit back, relax and enjoy the beach with your dog. The time of year can have a big impact on where you can walk your dog. Between the months of October (1st) and April (30th) you are able to walk with your dog freely along the Jurassic Coast of East Devon and the Exmouth area. Exmouth is the main beach in the area that gets a lot of sand, especially at low tide so to get the most out of your experience I would suggest planning for low tide, but there is sand most of the time and in the winter months you are free to walk all the way along the beach. At low tide Orcombe point at the eastern end of the beach opens up and this is where I like the most as it has more variety with the rocks (and fewer people) than the beach towards the town end. I find my tides book really helpful as it gives me the local tide times for the whole year. It’s only a few pounds so for forward planning I highly recommend it. As soon as 1st May comes around the exclusion zones for dogs on Exmouth beach kicks in. This means that a large stretch of the beach is now a dog free zone. Dogs are not allowed on the beach just before Orcombe Point right up to the Octagon in the west. This means that a large section of the beach is now dog-free and it will be much harder to walk your dog. The exclusion lasts until 30 September. For a map which shows the you the areas that dogs are excluded from see here - you’ll need to scroll down a few pages to get to the Exmouth map. It is also important to remember that during the summer months, Exmouth beach can get very busy. With a smaller area marked out for dogs to walk on, this can mean that your dog is going to be in close proximity to lots of other dogs. Therefore, you should only take your dog for a walk on the beach if they are comfortable being around other dogs. If you are concerned about having only a small area to walk on, then you could always go to the end of the beach by Orcombe Point when the tide is out. The beach area at this point is much larger, which means that you can let your dog have a proper run around. But still, when it’s busy parking can be an issue. An alternative to the main beach is the area just west of the town in the estuary. At low tide this opens up to a very large expanse of sand (some of it muddy and boggy) and I’ve been here when it’s been very busy at the main beach but here it’s fairly quiet. So it’s a great alternative. You can park on The Royal Avenue or at the nearby Imperial Road short stay car park. You can take a walk on the sandy bits (aka The Duckpond) and then go along the Exe Estuary Trail. If you are feeling intrepid you can also walk across the estuary to Starcross and back, but clearly you’d need to check the tides as you don’t want to get caught out by an incoming tide! I’ve not done that walk myself yet but I’ve been told it’s really nice (I don’t have pictures of this area, yet). You should also keep in mind that parking can be limited by Exmouth beach, particularly in the summer. Therefore, you may find that it is more beneficial to you and your dog if you travel to the beach earlier in the morning or later in the the evening. That way you are much more likely to find yourself a parking space and will definitely have the opportunity to have fun on the beach with your dog. Plus it won’t be as hot. 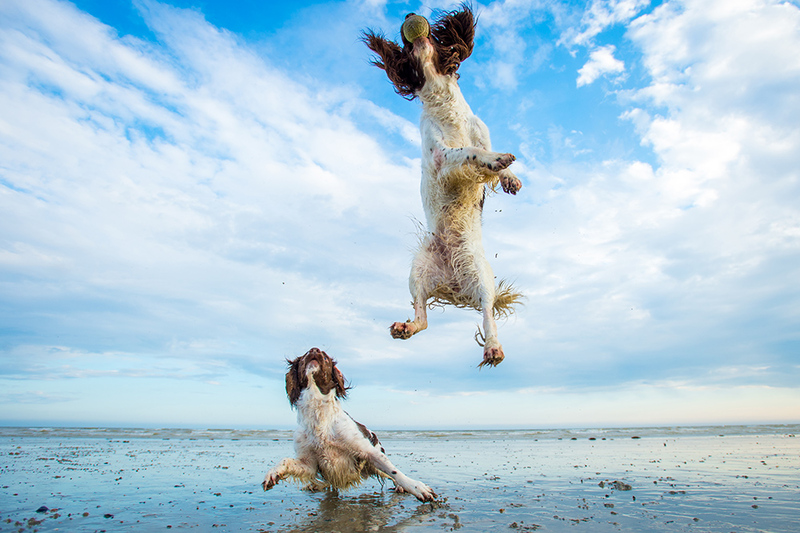 If you are just visiting Exmouth for a walk on the beach or if you are staying here for the long-term, then why not capture some fantastic images of your prized pooch to treasure forever? I can organise a photoshoot for your dog and work around your needs. See more information about my photo shoots. Sunset at Exmouth beach - it’s a wonderful time for a walk on the beach and a photo shoot too!